amNY has some thoughts. You'll notice that the winner, Jaques-Imo's is on the Upper West Side, which is to say basically in Vermont, and effectively as far away from you and your droll sub-14th existence as the real deal. * So plug in your dates here (the airport code you want is MSY), and the nice folks will take you to Domilise's, or Parasols, or Mother's in their pretty blue airplane for practically nothing. While you are there you can pitch the editor of the Times Picayune on a feature on the best bagels in New Orleans. *Compare this noble composition above left to the one pictured in the amNY article. The paper plate starting to turn transparent is your guarantee of quality. 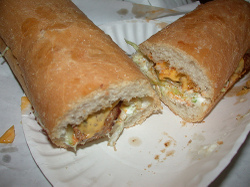 See also that the NY "po-boy" comes with fries, which I don't recall seeing ever as part of the presentation in New Orleans -- not so much because of Crescent City trans fats concerns, but because the whole point of the po-boy is that it is sufficient unto itself. The french fries are effectively saying "sorry you are not in New Orleans -- here are some french fries and ketchup to numb the pain of your existence." I get fries with my roast beef po-boys at Gene's in Austin, because I discovered they are good for soaking up the roast-beef gravy. But you're right, I've never had fries with po-boys in the NOLA area, I don't even think I've had potato chips. We ate bagels a lot in Metairie when I was in high school. In Metairie at the time, the only place to get them was in the freezer section of the grocery. I am not sure things have changed much since then. yeah, can't get a good bagel in New Orleans. Johnny's on St. Louis St in the French Quarter. And if the NYC place that deals with French Fries was in NOLA, they would simply put the French Fries between the french bread and have a french fried po-boy. Yes, Virginia, it really does exist. this looks so good to eat.